ABC has made some changes to its Wednesday night schedule for 2007. Nothing really out of the ordinary until you realize what’s missing. 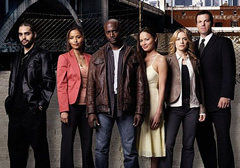 Bad news for fans of Taye Diggs and Day Break? Tune in and find out! It appears that ABC is no better than other networks. I am to the point that I am vowing to not watch any new shows until they at least last a season. FOX is great at doing this. I expected better from ABC. Will miss Day Break but am use to losing shows I enjoy. I can’t belive they canceled Day Break!!! It was a great show and kept getting more and more intresting. They really need to think again about what they did or at least give us Day Break fans a way to see the last 5 shows. I and others were watching the series too … how frustating to pull something like that type of a show. This has happened before on a series one had to stick with. ABC pulled that one too. Taye is a great actor – getting more and more press each year. He even comes from my home town! Then in place is more….sitcoms gee whiz folks. More junk to watch. Ugh! Sad in Rochester NY.